The foreign exchange market is growing—and operating—at lightning speed. 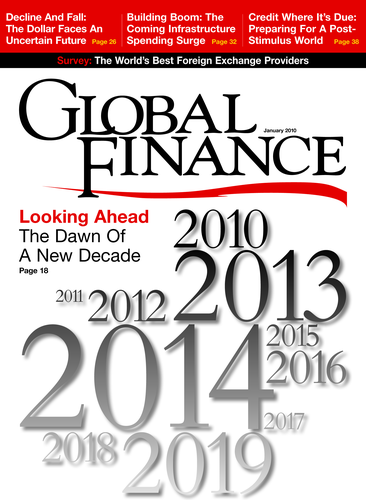 Global Finance selects the leaders of the world's biggest financial market. The best banks in the foreign exchange market performed well throughout the financial crisis, keeping the market open and helping clients to cope with the challenging environment. Many of them took advantage of the turmoil to increase their market share and develop new products that increased the ability of their customers to manage their currency risks. Boston-based consulting firm Celent estimates that average daily turnover in the foreign exchange market, the world's biggest financial market, will exceed $4 trillion in 2010 as hedge funds become more active traders. Electronic trading will continue to increase its market share, although there was a return to telephone trading during the financial crisis due to wide bid/ask spreads and a loss of confidence in counterparties. Pricing and liquidity are key concerns when selecting a foreign exchange provider, along with faster and more reliable execution of trades, according to Celent. For the most part, foreign exchange is a business characterized by high volumes and low margins, Celent says. However, post-trade services have emerged as key differentiators, it adds. In the past few years, banks have invested heavily in developing their electronic-trading capabilities across asset classes. The best foreign exchange banks—those that major corporations should consider first to handle their needs—are safe, reliable and efficient. They are the banks that put the interests of their customers first and do not cut and run when the going gets tough. Global Finance selected Deutsche Bank as the global winner. We also chose the leading foreign exchange banks in 85 countries and regions, as well as the best online trading systems, including bank-owned, independent and retail trading systems. In addition, Global Finance selected the best bank for foreign exchange research, as well as separate award winners for fundamental research, technical research, currency forecasts, and strategy and hedging. The foreign exchange market faces new uncertainties as regulators debate a move to central clearing and other potential measures to guard against future calamities and to increase transparency. Meanwhile, the continued emergence of foreign exchange as an asset class is heightening the need for speed and making it even more essential for FX providers to invest in new technology. Deutsche Bank not only has a leading market share in foreign exchange in almost every region of the world, but it is also pulling away from the competition. The bank has a bigger share of the global FX market than Citi, J.P. Morgan, HSBC and Goldman Sachs combined. "There are three main ingredients to our success," says Zar Amrolia, global head of foreign exchange. "We have tremendous people who work in foreign exchange who excel at what they do. We also have a [corporate] culture that puts clients first. And we have made major investments in technology." The size and depth of Deutsche Bank's trading business is unequaled. "We offer more competitive rates on a wider range of FX derivatives than any other bank, and in bigger sizes and longer maturities," Amrolia says. "We are a one-stop shop for foreign exchange. Others can compete in e-commerce or in Asia or in the funds or derivatives space, but nobody else can do it all," he says. At the height of the financial crisis, when there were record moves in almost every currency pair, Deutsche Bank responded quickly, thanks to continuous-review systems installed years earlier. "We contacted clients to warn them about the new risks they faced and provided them with advice on what to do about them by either restructuring existing positions or unwinding them as necessary," Amrolia says. The bank continually reviews, updates and enhances every FX product, strategy and position to ensure that they fit market conditions, he says. Deutsche Bank also developed a string of new hedging and investment products designed to perform well in the changed market environment. "At the same time, we developed new top-down, holistic analytical models that allow clients to get a much deeper, more strategic understanding of their FX risks and opportunities and to take views and hedge risks quickly and on a portfolio-wide basis," Amrolia says. In the autumn of 2008 Deutsche Bank executed nearly three times as many trades as it had been processing during the summer months of that year. In the second half of 2009 it regularly cleared multi-billion-euro trades for clients in the spot and derivative markets, according to Amrolia. Deutsche Bank is an active member of a working group advising regulators and governments on how planned regulatory changes could affect users of FX products. In order to prepare for possible global or regional clearinghouses and the potential shift of over-the-counter trades onto exchanges, the bank is part of an industry initiative called Melody to begin aggregating FX trades. Deutsche Bank also has started to design the infrastructure it will need to work with the clearinghouses if and when they are set up. Citi is one of the largest FX providers in the world, with currency trading and sales operations in 83 countries dealing in more than 150 currencies. "FX is a flagship business for Citi, which has a deep history of more than 100 years in the FX market," says Jeff Feig, managing director and global head of G-10 FX at the bank. "Management has shown continued commitment to invest and grow in the business despite the difficulties of the last two years," he says. In March 2009 Citi introduced a new electronic platform, known as Velocity, to meet growing demand from the bank's high-frequency trading clients, such as banks and mid-tier leveraged clients, for an extremely fast, flexible, stable and liquid trading system coupled with advanced analytics and post-trade services. The platform supports streaming executable spot, forward and swap pricing in more than 120 currency pairs. "We have focused on providing clients with the trading features they have most demanded," Feig says. "Clients can view full depth-of-book and can either take available prices or place limit, market-pegged or stop orders." All tools within Velocity are modular, detachable and customizable. The "time slice" feature enables clients to execute a time-weighted average price (TWAP) order, controlling the market impact of a large trade by placing separate orders at random sizes and times, and holding a particular order if prices go too wide or breach a certain level. Citi also has developed a new set of execution systems known as CitiFX Intelligent Orders, which combines nearly invisible execution capability with the ability to deal with very large volumes using the full liquidity of the market. Germany-based Deutsche Bank is the leading foreign exchange bank in Western Europe. "We deliver global products, information and ideas with a local relationship," says Zar Amrolia, global head of foreign exchange. "The competition doesn't have the same technology and quality of people in London and Paris. We have dedicated people who say, 'I'll come around to your office in half an hour and help you straighten out the problem,'" Amrolia says. "We have a deep understanding of the types of problems that European corporates face," he adds. "We are close to our clients and offer world-class solutions." Deutsche Bank is the leading designer of structured hedging strategies that enable clients to protect themselves against FX risk at a lower cost than is possible with plain-vanilla products, according to Amrolia. It is also the leading provider of investment products linked to foreign exchange, and the leading operator of FX indexes. "The world's FX markets have been the most volatile in modern history, making FX hedging more important than ever, but also much more expensive," he points out. "Credit risk has been another key concern," Amrolia adds. "We have helped large numbers of clients to reduce their exposures by moving to Deutsche Bank, which has lower credit default swap rates than many banks, and by restructuring their positions into unfunded swaps." The rise in volatility has created trading opportunities as well as risks, Amrolia explains. "We were the only firm to actively make markets in products such as variance and volatility swaps that allowed clients to exploit this trend," he says. Index-linked volumes have also boomed this year, with thousands of investors looking to gain access to FX trading strategies without having to put up large sums of money and without becoming exposed to excessive risk, he notes. Standard Chartered Bank has an unrivaled footprint in Asia, with onshore capabilities that enable it to deliver FX products and liquidity that its competitors cannot match. "We remained open for business during the recent crisis, which enabled us to develop even deeper relationships with our clients," says Richard Leighton, global head of foreign exchange and head of fixed-income trading, Europe, at London-based Standard Chartered. "Also, we have seen the recent market and industry dislocation as an opportunity for us to grow market share and invest in technology and people," he adds. "We hired exceptional talent into the business, across our footprint and into our two main hubs of Singapore and Hong Kong." Standard Chartered made particular investment in its FX options products this year and is now the largest liquidity provider across all Asian currencies, Leighton says. As liquidity dried up at the height of the credit crisis, the bank continued to quote all Asian currencies, both deliverable and non-deliverable forwards, to ensure that its clients had the liquidity they required to conduct their business. "We helped them to manage their mark-to-market issues amid sharp volatility, and we stepped in to provide liquidity at a time when other banks pulled out of the market," he says. Standard Chartered not only helped clients restructure their FX positions, but it also developed new structured products that incorporate protection and deleveraging features. As a result, clients can enter into structured FX hedges knowing there is a worst case in the event of unpredicted volatility. Standard Chartered Bank has the largest dealing room in Southeast Asia, based in Singapore. The bank offers a full range of products across all of its onshore centers in the region: Singapore, Thailand, Malaysia, Indonesia, the Philippines and Vietnam. "Our strong balance sheet, market-making experience and commitment to our customers allowed us to stay open for business even when the market and the banking industry were experiencing severe dislocation," says Richard Leighton, global head of foreign exchange and head of fixed-income trading, Europe, at London-based Standard Chartered. "We have continued to deliver innovative risk management and financing solutions to our clients." The bank is continuing to roll out multiple access channels to its FX customers in the region that make it easier for them to conduct their international business, Leighton says. "And we believe that we have a world-class research offering globally," he adds. Standard Chartered's presence in Southeast Asia dates back 150 years, giving it deep roots as a local bank that also has access to a global network. "We provide unparalleled cross-border solutions and opportunities throughout Asia, Africa and the Middle East," Leighton says. In Islamic finance, Standard Chartered has developed a range of shariah-compliant hedging and investment solutions that have opened up new markets and business opportunities. Customers from the Middle East and Malaysia who invest according to Islamic law can participate in investment strategies through structures approved by the bank's shariah committee. Stockholm-based Handelsbanken Capital Markets is the highest-rated bank in Scandinavia. "Our high rating and stability are part of our success right now," says Dan Lindwall, head of corporate capital markets. "Our quality services and strong balance sheet are important in the current market environment." Handelsbanken is also by far the largest corporate lender in Sweden. "We have long-term relationships with our institutional and large corporate clients," he says. "We provide added value and focus on customer satisfaction." Handelsbanken is one of the largest foreign exchange banks in Sweden, Norway, Denmark and Finland. The bank is also a member of FXall, the leading electronic trading platform. "We have a very fast response time because speed is what our FX clients want," Lindwall says. The bank was the first in the region to integrate its FX offerings with its fixed-income, commodities and equity products. "We have a centralized approach to risk taking," Lindwall says. "We have an added advantage of having our products in one place where we can deal between asset classes in an effective way," he says. Handelsbanken offers capital-protected investment programs, including currency-linked bonds, in which investors gain from a favorable move in the market and are protected against losing their capital should the market move against them. "With our capital-guaranteed, currency-linked bonds, you can make money from changes in foreign exchange rates without taking unnecessary risks," Lindwall says. The redemption amount either is linked to an index or is based on a model. Central and Eastern Europe experienced extreme volatility in currencies during late 2008 and early 2009. Deutsche Bank helped its customers with their FX risk management during this turbulent period. "We have a local presence, and we are there for our clients when they need us," says Zar Amrolia, global head of foreign exchange. The bank provided critical guidance and education in risk management. "Basically, we said, 'Here are the best practices and the way we do it at Deutsche Bank,'" he adds. During the financial crisis, Deutsche Bank was the only bank to continue making markets in all FX derivatives, Amrolia says. "But recognizing the severity of the risks involved, we cut back on certain types of business, such as uncapped structured trades, and introduced additional trade-approval processes on high-risk trades," he says. "We never withdrew from difficult markets, and we continued to execute extremely large, challenging deals." Deutsche Bank is present in 12 countries in the CEE region through subsidiaries or representative offices. In September 2009 it opened a new subsidiary in Ukraine. Target clients include multinational corporations and small and mid-size companies from Germany and the rest of Western Europe as well as corporate and institutional clients in CEE. Citi is the leading FX bank in Latin America, a region where it has long had a strong local presence. The bank has operations in 23 countries in the region and is a major participant in the vast majority of the local FX markets, from Mexico to Argentina. "We bring the capabilities of our global franchise to the local markets of the region," says Jeff Feig, managing director and global head of G-10 FX at the bank. "The results are a testament to our ability to provide fast, reliable and cost-effective FX and derivatives solutions to meet the diverse and specific needs of individuals, corporations, financial institutions, governments and investors in the region." Citi's leading market share in Latin America is a direct result of its aggressive pricing, execution capability, best-in-class service and strong local presence, Feig says. Citi's New York FX hub is integrated with the bank's local branches, helping it to meet the specific needs of each client. Citi's Banamex subsidiary is by far the largest FX bank in Mexico, where it has a 33% market share, up from 27% in 2008 and 25% in 2007, according to the Mexican central bank. Its closest competitor, Santander, has a 15% market share in total FX volume. Citibank Argentina offers FX services to more than 500 top-tier corporate clients, as well as to major institutional investors. Since 2002 the Argentine FX market has been highly regulated, with specific limits to buy and sell foreign currency for residents and non-residents. A key factor in Citibank Argentina's success has been its agile and timely execution. Ahli United Bank's head office, based in Bahrain, is the hub for its foreign exchange activities throughout the Middle East. While wholesale FX volumes in the region have been flat in the past two years as a result of the global economic recession, Ahli United detected a shift into currencies of the Middle East and North Africa (MENA) in 2009. These flows increased by 53% from a year earlier, driven mainly by funding activities rather than by any speculative trading, the bank says. The AUB Group has a presence in four of the six GCC (Gulf Cooperation Council) countries, plus Egypt, Iraq and the United Kingdom. AUB-Al Hilal, a Bahrain-based Islamic branch of AUB, recently introduced Islamic FX swaps. The bank says it saw a need to provide its Islamic branch clients with a shariah-compliant tool to hedge their cross-border currency exposures. AUB is a main market maker in the Bahrain dinar and provides FX trading for corporate clients and institutions six days a week during European and regional trading hours. The bank provides daily commentary on international and regional markets and advises clients on structured hedging solutions and trading opportunities, as well as upcoming data releases. AUB expects to see a pickup in economic activity in the MENA region in 2010, as higher oil prices enable GCC governments to expand their fiscal budgets. FX market volume will show strong growth this year, as global trade prospers and economic conditions improve, the bank says. Standard Chartered Bank offers a comprehensive product range across all of the major African currencies, with FX traders in 13 countries onshore in Africa and a trading hub in Dubai. "No other bank, international or regional, has more coverage across the top African markets," says Richard Leighton, global head of foreign exchange and head of fixed-income trading, Europe, at London-based Standard Chartered. "We have pioneered the development of forward and option markets throughout Africa with a client-centric business model," he adds. "We are connecting the region to global markets and recently opened the first Africa FX trading desk in New York." Standard Chartered is a leading emerging markets bank and earns approximately 90% of its income and profits from Asia, Africa and the Middle East. "Trade corridors opening and developing between Africa and Asia have particularly played to our strengths," Leighton says. Spanning more than 70 countries, Standard Chartered's wholesale banking business provides a wide range of products to help corporate and institutional clients facilitate commerce and finance across some of the fastest-growing markets in the world. Standard Chartered opened its regional trading hub for the Middle East and Africa in the Dubai International Financial Center in 2008. With 200 seats, the bank's Dubai trading floor is the largest such facility in the region. The bank was the first to offer comprehensive research on African FX and money markets. It was also the first bank to electronically quote African currencies 24 hours a day and the first to offer African currencies via executable streaming prices. BNY Mellon has provided insightful research on the foreign exchange markets during a time of turbulence and uncertainty. The bank's clients include global asset managers and hedge fund investors, as well as corporations, brokers, dealers and correspondent banks. With more than $23 trillion in assets under custody and administration, the bank is favorably positioned to measure and interpret cross-border flows. "Our focus on fundamental analysis of the currency markets, combined with the unique insights we gain from monitoring cross-border investment flows through BNY Mellon's custody systems, are recognized as value-added features of our foreign exchange service," says Jorge Rodriguez, executive vice president and head of global FX sales at BNY Mellon. The bank is a leading foreign exchange provider and one of the largest FX dealers in the US market. It makes markets and holds positions in more than 100 currencies and offers a wide range of customizable FX products, in addition to producing numerous daily reports on changing market conditions and investment opportunities. It is a leader in technical analysis and currency forecasts, as well as fundamental analysis of the market. The bank's currency management specialists provide specialized investment advisory services to institutional investors. For corporations, its FX offerings are integrated with its cash and liquidity management services, which are backed by a network of global offices. Brown Brothers Harriman's foreign exchange services are relatively unusual in that the firm is highly focused on one important market segment: mutual funds, unit trusts, insurance companies and pension funds, or what market participants refer to as "real money," says Marc Chandler, global head of currency strategy at BBH, the oldest and largest partnership bank in the United States. "That means our analysis can be more focused to serve the medium-term investors without having to worry so much about being everything to everyone," he says. "The thought leadership provided by our analysis complements the other points of excellence BBH has developed, from pre-trade to post-trade services," Chandler says. "In our commentary and analysis, we integrate fundamentals and technicals, policy and economics, different asset classes, and major and emerging markets." BBH offers FX services 24 hours a day from its locations in New York, London and Tokyo. The firm has trade-execution and research capabilities covering more than 75 markets. "In addition to our thought leadership and integrative thrust to our analysis, the FX strategy team is committed to helping broaden and deepen client relationships," Chandler says. BNY Mellon's foreign exchange decision-support tools are among the most sophisticated in the market. They help investors manage currency exposures and take advantage of trading opportunities in both developed and emerging markets. The bank's iPFM and iFlow products provide a graphical illustration of non-domestic investment flows into and out of major asset markets, mapped against currencies, equity indexes and fixed-income benchmarks. Its quantitative research tools offer valuable insights that complement its fundamental research in the FX market. BNY Mellon's daily foreign exchange rate report gives clients easy access to rates for more than 50 of the most frequently traded currencies, helping clients to quickly determine the rates the bank will apply to their payments. Its iFX Manager online foreign exchange trade order management and execution system provides end-to-end capabilities to support all aspects of FX workflow. Customers can automatically import FX trade requirements from in-house systems and integrate straight-through processing to reduce the time, cost and risks of trading. The iFX Express product, for clients who do not require order management, offers the ability to chat with a BNY Mellon trader online to discuss hedging strategies while executing a trade. The bank's decision-support tools include historical charts with trend lines, as well as trading signals and statistical output on simulated portfolio performance. Its range of derivatives products can be structured to accommodate a client's specific exposures, market outlook and acceptable risks. BNY Mellon, the world's largest custodian of financial assets, has unique insights into the market as a result of its proprietary capital-flow data. The bank provides monthly updates on quarter-end currency forecasts in more than 70 currency pairs. Its forecasts are based on economic and capital-flow fundamentals in the major currencies. Forecasts for emerging markets incorporate purchasing power parity and other currency-regime factors. The bank also uses a value-based process to identify currencies that are trading out of line. An upgraded and expanded version of BNY Mellon's iFlow product is being introduced this month. The bank's iFlow data from its monitored assets represent more than 20% of all tradable assets in most markets. The iFlow system encompasses daily investor activity in both developed and emerging markets. Foreign exchange hedging is more important than ever as a result of increased volatility in the market. "At the same time, it has become harder for institutions to obtain credit lines from banks, and the mark-to-market value of hedges has become very volatile, creating unwanted P&L; [profit and loss] volatility," says Zar Amrolia, global head of foreign exchange at Deutsche Bank. The bank has greatly increased its activity in strategies that enable clients to pay lower upfront premiums than in the plain-vanilla forwards and options markets. These include option-replication strategies, where the protection kicks in only if a certain business exposure materializes. In addition, Deutsche Bank created portfolio overlays that allow clients to reduce overall hedging costs by analyzing and netting positions. In March 2009 the bank created the first-ever holistic FX hedging tool, known as FlexFolio. "This is the first product that allows investors and borrowers to put a cap on the potential mark-to-market losses on all their FX hedges via a single contract," Amrolia says. "No matter what happens, in a worst-case scenario you lose only the face value." The FX hedging strategies using FlexFolio can be adjusted over time to reflect changes in the volatility of the FX risk being hedged and changes to the credit risk of the counterparties involved. Applying the CSA (credit support annex) concept widely used to document collateral relationships for derivative transactions, Deutsche Bank has enabled FX clients to use collateral other than cash as margin for their trades for the first time, thereby reducing the amount of capital their FX hedging consumes. Currenex, the online FX trading system owned by Boston-based State Street, provides advanced workflow-processing solutions, with deep liquidity and fast execution of trades. It offers high-performance, integrated systems for FX trading aimed at clients that require the latest technology and the widest choice of how they trade. Professional traders, banks and retail-trading providers use Currenex to meet their diverse needs, with liquidity provided by more than 60 global banks and other market participants. Currenex is a leader in high-speed trading technology. It has the fastest matching engine and has achieved sub-millisecond speeds. Its ECN-based platform provides live streaming quotes and has an important customer base with high-speed, black box traders. Graphical user interface (GUI) traders also make up an important part of ECN (electronic communication network) participants. For these institutional clients, Currenex provides charting and news feeds. Currenex Viking, a customizable interface, allows multiple order types that give traders control over timing and execution. In addition to algorithmic models, Currenex offers chart trading, which allows its customers to trade directly from a range of charts. Currenex also offers a white-label solution, a retail ECN, with credit and margin modules. Currenex is the first ECN to provide currency forwards in a continuous-streaming format. The firm's margin-trading technology enables FX providers to automate risk management by controlling leverage on a customer-by-customer and currency-by-currency basis. FXall's trading volume has grown every year since the system was introduced in 2001, and last year it reached $15 trillion. The company specializes in providing FX trading and workflow solutions, and it aims to give its customers an edge in the market with its advanced technology. FXall has a diverse base of more than 800 large, institutional clients, including corporate treasurers, asset managers, hedge funds, CTAs (commodity trading advisers), broker-dealers and banks. The FXall system is integrated with more than 70 of the world's leading FX market liquidity providers, which deliver more than 200 pricing streams across more than 500 currency pairs. FXall offers anonymous as well as relationship-based trading platforms. FXall provides a one-stop solution to all trading, workflow and post-trade processing requirements. It does not act as a principal in the market and thus avoids conflicts of interest. In response to the dislocations in the financial markets in the fourth quarter of 2008, FXall introduced several innovations, including FXall Trading, the first FX trading solution that offers access to both relationship liquidity from banks and an anonymous electronic communication network (ECN) on a single platform. Another new product, Cross Currency Netting, enables clients to better manage high-value, multi-currency exposures. This tool helps clients identify principal risks within a currency portfolio, which can then be transferred to the customer's chosen bank or custodian, with details automatically processed by FXall. Forex Capital Markets (FXCM) is one of the largest global foreign exchange brokers, with more than $365 billion in monthly notional volume traded on its platforms through an average of more than 8 million trades. Founded in 1999, FXCM was one of the first online FX trading platforms that gave traders access to the interbank market. Today, it has more than 150,000 live accounts and employs 150 programmers. "No one has more experience than we do," says Drew Niv, CEO of FXCM. "We have gone through an enormous amount of development and have tremendous capabilities." At the heart of the system is back-to-back execution with the world's leading FX banks, which compete to provide prices. "This model eliminates any conflict of interest between broker and trader by ensuring that there is no dealer intervention in trades," Niv says. FXCM has developed white-label relationships across the world with major banks, brokerages and large financial institutions, each working with a customized platform designed and built by FXCM. "We have listened to feedback from our clients and built the system to satisfy the users," Niv says. "It is one of the most robust systems out there and has an ECN built into the back of it." FXCM serves both retail and institutional markets with its various platforms. "We are committed to education and technological innovation that enhances the online trading experience," Niv says. FXCM's website at www.dailyfx.com issues more than 30 reports daily on developments in the FX markets. The reports are mainly based on technical factors and include analysis of sentiment data based on option volatility.